Embrace the summer: come to terms with your local ice cream truck chime, and admit that you crave -- nay, require -- its catchy 20 second hook on glorious infinite repeat for maximum seasonal enjoyment. Last year, I dug up MP3s for a few of the most common ice cream truck songs heard on the sweaty streets of NYC. Be sure to visit this post, where you can grab MP3s of such summer hits as the Mister Softee (RIP) jingle, the Ghetto Ice Cream Truck song, and another tune that someone smarter than me identified as "And The Band Played On." And if you're really curious about that signature tinny ice cream truck sound, read this post in the excellent Music Thing blog. Here's a big ol' article about the history and origins of ice cream truck music (via Confederacy of a Dunce). Ice cream truck music history? I know it's shameless self promotion, but an article I wrote about the history of ice cream truck music got published a couple years back a great arts magazine called Esopus. As cool as the Musiclink outline is (and believe me, it's technological coolness is not lost on me), mine is a bit more comprehensive. Oops. Didn't see that the article was linked already! (I just got so excited about seeing someone talking about ICTM.) Sorry! Where I grew up the ice cream trucks simply just wrang a bell. In the suburbs where I live now, Jack N' Jill has reigned for a few years with its ersatz piano rag ( Scott Joplin? ). The Blue Bunny, a competitor, has arrived this year. I'm still trying to figure out what its music is. I think its La Cu Ca Racha. I grew up in a tough neighborhood. The icecream vans played "Helter Skelter"
I knew Melted Drumstick Melancholy sounded familiar - it is track 1 of the Conet Project and is known as the Swedish Rhapsody. See Conet Project at http://www.irdial.com/conet.htm . 'Lips Stained Blue' is actually the Cuckoo Waltz. 'Melted Drumstick..' sounds like the 2nd half of Red Wing. 'Creamsicle..' sounds like And the Band Played On. 'What the Hell is..' sounds familiar but I cant think of the name. I think the lyrics are Navy-themed if I'm not mistaken. What the hell is ... sounds like "Bicycle Built for Two". It should be said that most ice cream trucks play hella weird arrangements of public domain tunes (Joplin's Entertainer, Brahms' Lullaby, whatnot), and the superlicious sound systems make 'em sound even funkier. The only thing better (or worse) that I've heard was the guy who cruised some of my old stomping grounds in a Yugo ... with a hood scoop ... and what sounded like football stadium tweeters (we never did hear a note of bass; always thought he must've had serious high-freq hearing loss ... or a tendency to think "treble rebel" was a term of endearment). "What the Hell is..." is indeed "Navy-themed"; it is "Sailing, Sailing (Over The Bounding Main)", known commonly as "Sailing, Sailing (Over The Ocean Blue)", composed by Godfrey Marks [pseudonym of James Frederick Swift], first published in 1880. We have two competing trucks that visit our neighborhood in Iowa, and one plays Scott Joplin, while the other steals our souls with "Music Box Dancer." I was living in England during the deep winter one year and couldn't get over the truck that cruised our street every evening, despite the bone-chilling cold. I admit I couldn't resist the ice cream sandwich (handmade before your eyes between two large sugar wafers) drizzled with raspberry sauce. YUM. the icecream truck song will never die as long as they can be downloaded as a F**CKN CELL PHONE RING. does that express enough of my iritation with being force fed someone elses idea of good tunage? We had the Mr. Softee tune in Kensington, Brooklyn, but we also had a truck that played an awesome, Russian-sounding tune, reminiscent of the Tetris theme that is sadly not represented here. Thank you so much for the great Ice Cream Jingle links! My first exposure to IceCream Truck Jingles was in Karlsruhe, Germany. A truck which looked and sounded just like an american ice cream vehicle would visit our neighborhood daily, but instead of ice cream, it served children's beer to all of us kids...it looked and tasted just like beer..without the alcohol! When we moved back to Washington State, I missed that old truck with the cold beer. We have an ice-cream truck SOMEWHERE near our neigherbor hood that plays the exact same pink panther pops/turkey in the straw song. I've never seen it. The song haunts me. Great idea for adding to a mix for something completely different. our ice cream man plays a song called happy wanderer, what you lot think of that tune ? Speaking of creepy/wierd: when I lived in the northern part of Brooklyn NY (Greenpoint / Williamsburg / Bushwick) the ice cream trucks played "Send in the Clowns". The swedish hemglass tune was composed by famous Swedish Classical choir conductor Robert Sund. Rumour has it that the pay was a life-time supply of icecream. ice cream trucks are awesome!!!!!!!!!!!! my ice cream truck plays 'hitler has only got one ball' but i dont know the actual name of the tune. 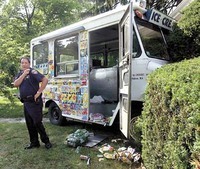 In MASS they are trying to BAN Ice cream trucks from playing ANY music at all. This JUST aired on tonight's 10pm news of FOX 25. If they get the bill passed, we'll be taking down the ice cream man like me did the milk man. I miss the milk man! Freakin stupid if you ask me! !